Welcome to the Gold Goblin, handsome, the hot spot for turning fortunes and winning wagers beneath the arch. Looking for the squarest games, most honest dealers, and prettiest blamed barmaids anywhere in the port? Well, you found ’em, sugar! Ready to be a rich man? Hope so, ’cause tonight’s your night. Belly up to a table and get to winnin’; we’ve got the gold to make your dreams glitter. Good drink, fine food, and warm company’s extra, but we’ve got all that too—at prices so cheap we might as well be giving it away. So find a spot, honey, order a pint, and leave it all to us, ’cause here, even a goblin could win his weight in gold! The Gambling Tournament started off as a success, but after a failed heist he ended up having to pay off a few irate customers and hire on a whole slew of new staff, including the PCs. Since their hiring he has been extremely pleased with their performance, as they successfully defended his prize money with no casualties, defused a growing riot the next day, killed an intruding cindersnake and took some gold from Clegg Zincher. Saul Vancaskerkin/ DM: The mismanaging owner and proprietor of the Gold Goblin Gambling Hall. Barmaids, Cooks, Other Staff: male or female human commoner 1. Bartenders, Cashiers, Croupiers, and Dealers: Male or female human expert 1. Guards: Use the Riddleport thug stats on page 9. Eidos: Walks the catwalks above the hall as spotter in conjunction with his Eidolon. Lives in the suite with Bitchel. Krugeth: Works as a performer/spotter. Lives in the northeastern-most private room at area 19. There are four games presented from the book Shadow in the Sky, as well as a simplified gambling system for quick rolls. These are all described on the Gambling page. Note: This is what is known to the players, for full information see page 59 - 63 of Shadow in the Sky. This grand establishment has seen better days. A wide veranda runs along the front between two short wings of the building. A massive, brass half-dome tops the building, but it is now tarnished and marred by the impact of years of weathering and bears a patina of greenish brown. Standing before the main doors of the building is an 8-foot-tall statue cast in shining gold to resemble a largerthan- life goblin. 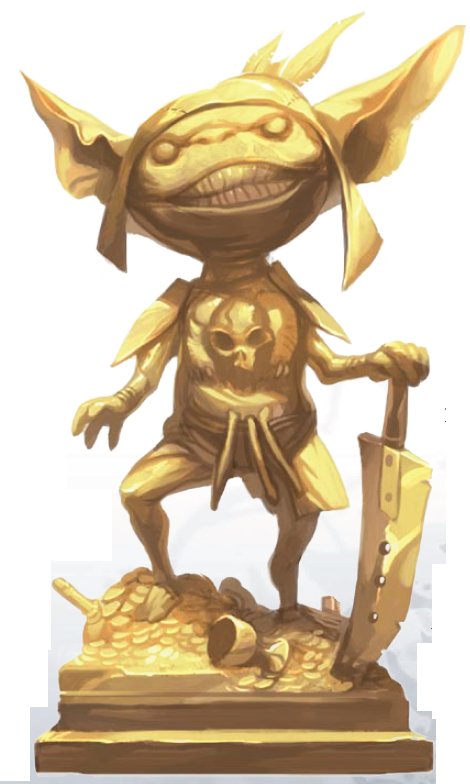 It balances a golden dogslicer on a pile of gold as it smiles smugly down on all customers who pass beneath its gaze. A DC 12 Appraise check is sufficient to note that the statue is made of shining brass rather than actual gold. The doors themselves are of a strong dark wood imported from southern lands and are decorated with multiple panels depicting signs of luck and good fortune (four-leaf clovers, crossed fingers, and so on). They can be locked (Open Lock DC 20) and barred from the inside. The casino floor is a wide room carpeted in rich red that has been recently patched in many places. Spread throughout the chamber are tables where different games are run. The floor hours are usually 12:00 pm to 3:00 am. Silken banners hang from floor to ceiling along the walls, and wide vertical blinds are drawn over the windows when morning light begins to peer in from the east. The chamber has a false ceiling 20 feet above, draped in layers of horizontally hung, gauzy beige curtains (in actuality there is no ceiling directly above these curtains—see area 30). Light is provided by numerous chandeliers hanging below this false ceiling as well as several large copper braziers spaced around the room with live coals to give the chamber a more hellish light for the tournament. At the back of the chamber between the kitchen doors is a small dais bearing a bust of Desna, goddess of luck. This foyer provides access to the cashiers’ counter, which is secured by a row of vertical bars set firmly into the stone floor. Two cashiers work here during operating hours. There are chips in various denominations totaling 10,000 gp stored in here at any one time. Two full-time guards, Hans and Beyar, reside in this chamber and guard access to the cashiers and vaults. They have keys to the guardroom and daily cash storage. One usually guards the cashier while the other watches over the daily cash storage during operating hours, taking only occasional breaks one at a time. This locked room holds the daily chips and monetary fund. Vancaskerkin likes to open the vault only once a day—usually early in the morning before the casino floor opens. There are another 10,000 gp in chips stored in this room. As with all of the other chips at the Gold Goblin, these are unique to the establishment and worthless outside its doors. One cashier and Beyar are usually here during operating hours. After closing, several of the guards and trusted staff members retire here with Vancaskerkin to count the day’s receipts and secure them in the night vault. At all other times, this room holds only a table with a few chairs and some slates with pieces of chalk. It is otherwise kept meticulously clean. The door to this reinforced chamber is composed of 6 inches of solid steel. Its hinges are securely nested in the stone wall. Seven keyholes and a locking wheel are set in the center of the door (Lock DC 40 each). All the locks respond to a single key (although the duplication thwarts overly easy access through knock spells), which is believed to be the key mounted on Vancaskerkin’s wrist stump. He never opens this door when anyone is in room 7, ushering out all employees before doing so. The cash boxes sitting on the shelves of this chamber should hold many thousands of gold pieces based on the casino’s take. This office is outfitted with an elaborate mahogany desk and a comfortable chair. Before the desk sit two more chairs of less-comfortable design with manacles set into their arms. The walls are painted a flat black, and a single candelabra provides only a dim light. The desk is covered in records and receipts from the day-to-day running of the establishment, and this chamber is likewise where Larur Feldin and a few of the guards sweat anyone caught or suspected of cheating the house. These rooms are comfortably appointed and hold two or three tables and a dozen or more chairs. Normally they are rented out for private parties at a rate of 5 sp per hour. During the tournament they are open to the public and are where games of poker and golem are held. When rented privately, all food and drink prices are triple what is charged elsewhere in the casino. A lone guard normally monitors those entering this chamber. Within is only a simple wooden staircase descending into the cellar. During the tournament, this chamber is kept locked. This massive chamber houses the true heart of the gambling hall—its kitchen. Staffed by a dozen cooks, it remains open from 11 am to 11 pm, serving all manner of dishes and snacks. Side pantries hold dry goods and serve as cold storage for sides of meat and fresh vegetables. While open, the kitchen serves meals and standard fare at one-half PH prices. A wooden tub holds grimy water and a smattering of soapsuds for cleaning the multitude of platters, trenchers, jacks, and cutlery used in the Gold Goblin. Firewood is stored just outside the back door and is distributed to the hall’s various fireplaces once per day. This simple chamber holds a few battered chairs and cushions for tired employees to use when on the short breaks that Vancaskerkin allows them. A stair rises to the second floor. A spittoon in one corner is about half full of foulsmelling remnants. This bar serves the entire house with a constant line of serving wenches taking orders and carrying trays of drinks between the bar and the casino floor. Two bartenders work the bar during the casino’s hours, serving drinks and occasionally picking a sot’s pocket. A long bar of polished wood extends along the back wall of the room and curves around at the end. Behind are mirrored shelves holding all manner of glassware as well as kegs of ale, beer, and mead and bottles of wine and liquor. At each end of the bar is a large tip jar. Each of these rooms is a simple privy that can accommodate four people at once with a modicum of privacy. The door of one is marked with a sword and the other a cup (sometimes leading to considerable confusion as to which serves what gender and creating the occasional embarrassing situation). Vancaskerkin is aware of the confusion this antiquated symbolism causes, but finds humor in the faux pas that sometimes occur. This chamber serves as the entrance to the guest wing. It is floored in white marble, although the hallway and rooms themselves have only thin, somewhat worn carpet over wooden planks. In the center of the chamber stands a marble statue that once depicted a robed maiden holding a harp, although its head and one arm are now broken away and missing. Vancaskerkin passes this off as an ancient piece of art, but actually got it cheap from a shipment of art that was damaged in transit. This suite consists of a large anteroom with a chaise longue and two chairs as well as a master bedroom with a kingsized feather bed and modest furnishings. It is rented for 3 gp per night. These rooms are simply yet comfortably furnished with a double bed, table and chairs, and a fireplace. They are let for 5 sp per night. This room is basically identical to the other guest rooms, save it has a small side room with two cots that can be used for manservants or storage. Its nightly rate is 1 gp. This closet holds the linens for the guest wing. They are replaced by a laundry service once a week. This cold, sparsely appointed chamber has a small fireplace, a threadbare rug, and 12 simple cots with thin mattresses. A curtained-off section holds a privy bucket and a window for emptying it. Those hirelings of the house that don’t live elsewhere reside here. Currently, only six hired guards make their residence here. Between them they have personal effects with a total value of 35 gp. This large chamber has numerous closet rods and a clothesline strung across it that hold the costumes and uniforms worn by the gambling hall’s employees. All servers, bartenders, cashiers, and floor personnel have a uniform. In addition, sometimes costumes are utilized by the Goblin’s employees, such as for the tournament, or on the occasions when dancers or entertainers are hired. Among the articles hanging here are enough clothing to piece together 1d3 of each of the clothing outfits listed in the PH except for the cold weather outfit and the royal outfit. Also of note in the dressing room are a half dozen of the succubi outfits used in the Cheat the Devil event. Two plush-but-worn suede couches sit before a roaring fire and low end table here. Guests who have business with Saul Vancaskerkin wait here, and he and his chief employees sometimes take their ease here as well. A bell pull in the southwest corner summons a server from area 15 to take complimentary drink orders. This large chamber holds a massive desk with a chair covered in the hide of a wyvern. Numerous paintings hang on the walls, including one that shows a group of canine therianthropes gathered around a table playing a game of golem. A humidor on the desk holds a number of fine cigars (15 gp total) next to a mother-of-pearl snuffbox (30 gp). Several cushioned chairs sit before the desk itself for visitors. This chamber is Saul Vancaskerkin’s office and the nerve center of the Gold Goblin. Only his most trusted colleagues or most distinguished guests are ever invited in here. This locked room holds cabinets stuffed with reams of paperwork. These are the accounting records for the Gold Goblin. Casual perusal reveals a struggle in recent years that picks up in profitability just a few months ago. A fine table marred by a few nicks and scratches stands surrounded by eight chairs and surmounted by a trio of gold candlesticks (10 gp each). The walls of the chamber are covered in thick purple tapestries depicting goldthreaded nymphs frolicking in a silver-threaded forest (total value 200 gp). The tapestries completely cover the door to area 30 (DC 20 Spot or DC 10 Search check to locate) to prevent light from shining through into that chamber. Vancaskerkin and his management team take their meals here. PCs have been invited into this area to join in the meals offered there whenever they wish. Despite his pretense of growing prosperity, Vancaskerkin’s room is quite austerely furnished with only a small cot, washstand with basin and razor, and a dull bronze mirror. Used alternatively by managers, important guests, and business partners, this comfortably furnished chamber is currently unoccupied. Three bunk beds are shoved against the walls next to a pair of wide wardrobes. A small table with three chairs is pushed into one corner, and two overstuffed chairs sit on a wolfskin rug before the hearth. The entrance to a small privy is covered by a thin curtain. Bitchel and Eidos currently live in here together. These narrow, swaying, railed catwalks hang suspended by chains hooked to the ceiling 10 feet above. Immediately below them is a layer of gauzy curtains serving as the false ceiling of area 2 below. Security personnel typically patrol these walks watching for cheaters. This chamber holds large barrels of common port and rows of bottles holding wines and various other alcohols. The floor manager and head bartender hold keys to the door of this chamber along with Vancaskerkin. The room bears a subtle, musty odor underlying the spoiled, sweet stench of wine.